With the arrival of Pokémon X & Y now just two weeks away, at the time of writing, it's perhaps worth a reminder that new 3DS XL hardware has been released to celebrate the titles. The pictured systems hit stores on 27th September in North America and PAL regions, priced $199.99 U.S. / £179.99 / €199.99. As the release date has probably tipped you off, and no doubt aware of the fact that bundling the game would simply lose almost guaranteed sales, these bundles will not have either game pre-installed or included, so you'll still need to buy those separately. Have any of you ordered one of these, or do you plan to? Let us know in the comments below. I don't understand releasing these 2 weeks before the games come out but not releasing bundles. They released the WW HD bundle 2 weeks before the game came out. Even if they made them $239 w/ a DL installed. Just seems weird. Yes please. Shame I already own an XL. I really don't like these designs (though I'd prefer them to the default 3DS XL colours). The Charizard 3DS XL is one I'd snap up in a heartbeat though. I can't see these selling all too well seeing how they won't include the actual games they're representing. You can even save money by just buying a 3DS XL with a regular colour scheme since they often sell for a bit less than that. They would have needed 4 bundles if the games was included because of x and y. I picked up the blue one the glossy finish is rather remarkable. I'm getting the red one sometime next week. Hopefully it will be in stock by the time I have the money for it which is a week from yesterday. I got the blue one yesterday, it's pretty cool and fun to play on. If they came bundled with an early release, i'd pick one up. Since it doesnt, i dont really care that much. My regular 3DS is just fine. @bluecat When I upgraded, I kept mine for my inevitable trading between games since I have SS, Black, and Black 2. Then again, mine is the Zelda 3DS too and there's no way I'd part with it. Hope you enjoy your XL! Once you go big, it's hard to go back though. The original just feels ridiculously small in comparison after a while. I have my Zelda 3DS, but I'd buy eithee of these two in a heartbeat if I had the money. I only have the money for both X & Y, so I'll just have to buy both versions, as I've planned to do so since the first trailer. Be honest with me, guys. If I have a standard, launch-model 3DS, is it really worth upgrading to an XL? @MasterGraveheart The biggest upgrade is the battery life (huge increase), and the biggest trade-off is that it won't be pocket-sized anymore. Outside of that, it's your call. I'm kind of used to XLs now, but there's nothing really wrong with the normal 3DS. Also, I think it's harder to break the hinge connecting the screens on the XL. If I did upgrade to a 3ds XL this would be the version I would get. Though by the time I do upgrade, these will likely be all sold out. @MasterGraveheart You can also spread your hands more on the XL so it is very comfortable. It also does not get that glossy and oily look due to the shine of the system. I think the Pikachu one is better anyway, cause it's more eye-catching to those who aren't familiar with Pokemon/Nintendo. I got a blue one yesterday. It looks so awesome. I am interested on this but Amazon does not carry them, so I may have to pay more to get it. And since I already have a regular 3DS and tons of games are being released during these months, then I may not get it. Still, it is much better for me that the game is not included. Lets you choose if you want to download it, buy it physical or just upgrade to an XL. People complaining they aren't bundled--they don't want to tie one version of the game to one color 3DS. What if they bundled Y version with the red 3DS, but I wanted the Y version and the blue 3DS? etc. They could have done a deal where you get x amount off if you buy the game with it, but whatever. @Garios Good point, but I held on to my DS Lite and DSi for that. But then I suppose for the NEXT Pokemon game, it'll be on the 3DS eh? I'm just really starting to pile up the DSs...DSes? What is the plural of DS? I pre-ordered the Blue X & Y model as well as Pokemon X at my local Gamestop on Sept 9, and I picked up the system Sept. 27. I mainly played Pokemon on my DS systems (regular and lite) so I thought that I might as well get a pokemon themed 3DS to compliment my game. I actually love the design on the cover and the 3 starters on the back. It's not as intricate as the Pikachu one but it still looks nice. I only wish that the inside was not simply a bland black. Also, the x and y systems not being part of a bundle is probably a blessing in disuguise. If this was a bundle it would have been a digital copy, and I simply prefer having a physical copy of my games (I do get digital but only for virtual console, DLCs, and indie games that take up less memory than retail releases). @mumof3kids82 It depends on the store. I got my blue one from Gamestop, and they only had six of each color. I got the 4th blue one they had. Wanted to upgrade for a while now and this was just what I waited for. To all the people scared about losing portability, it's not as huge as it seems (at least not for me). It still fits in my pants pocket comfortably. @bluecat I'm in the exact same boat. Mine is still sitting in the box until I can decide what to do with it. Also... it's just magnificent in person. @sinalefa This does sell on Amazon.ca so it should on Amazon.com mine was shipped yesterday. I got the red one yesterday, even though I already own a Pikachu 3ds. I got it for collecting purposes. @Big_Boy_Chubs It's a rip off? 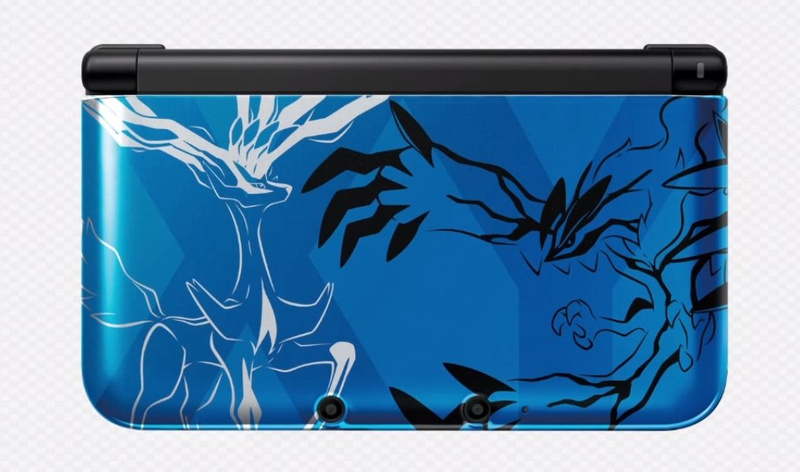 It's a 3DS XL with a special design at the same price as a regular 3DS XL. Define "rip off"
@TwoSmoove Oh I suppose what does one more handheld matter anyhow? I still got my GB Pocket, GB Color, GBA SP, in addition to the DS Lite and DSi. I could use the cash right now but at the same time having two 3DS might be useful down the line. I got my blue 3ds xl during targets sale for $159.99. Its been months and there still hasn't been a sale as good as that one for 3ds. If you don't have a 3ds now and not waiting for pokemon X/Y I would wait till black friday to buy any 3ds. For some reason Amazon.com does not sell Nintendo systems directly, only through other retailers, and these never lose a chance to charge a lot more. Right now I would need to pay around $50 USD more for them. @ScroogeMcLz ripoff / annoyance: Buying a "special" 3ds system expecting a game ( you'd assume there would be a game) and getting nothing. Then, two weeks later, having to buy the game to then play it on your special system. @sinalefa Well that's a disappointment then. Well goodluck on maybe getting one if you get the chance. I got the red one yesturday! It looks even better in person than it does in the pictures. @sinalefa Now the 3ds is out, in ebay new 3ds pokemon 3ds are available and no so expensive. I got me a shiny new Limited Edition Pokémon Yveltal Red 3DS XL at the weekend. It looks flipping awesome and It is in my pocket now - I am sooo happy! Next to get the PKMN X Digital Download for it and my life will be complete!!!! I can imagine a few kids buying this and ending up disappointed that there's no Pokemon game inside. A friend of mine upgraded from his black 3DS to the blue X/Y XL edition and I think the system is gorgeous. The gloss finish and design is top notch and even though it shows finger prints easily, I think I like it even more than my blue XL. Ugh. More red and blue for North America. I bought the standard 3ds the day it released. I been wanting to up grade to the xl. This was the perfect time too. I got the red pokemon xl on the 27th and it is exquisite! I absolutely love it. I pre ordered Y and can't wait to get it. For now ill just finish up ocrarina of time on master quest!